Celebrate milestones with our elegant Angelique Bell. 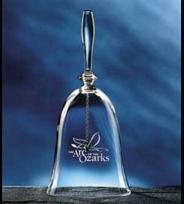 This crystal clear bell will surely get attention when struck by its crystal clapper. Dimensions: 7.5" H x 3.5" W Max. Etch Area: 2" H x 1.5" W Ship Weight: 1 lb. 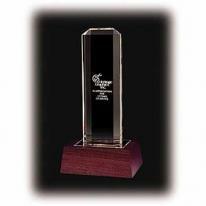 This 3/4" jade award sits horizontally on a jade base to prominently display any message. 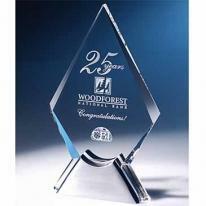 Your logo can be large on this spacious award! Materials: Jade glass Product Size: 4"w x 3-3/8"h x 3"d Imprint Area: Back (Standard): 3"w x 2"h. Packaging: Gift boxed Pack Of: 1 Weight: 2 lbs. 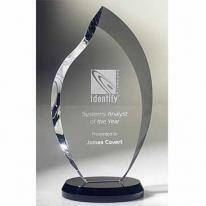 Jade Award has appealing balance in both horizontal and vertical design. Give this for your next safety award! Materials: Jade glass Product Size: 3"w x 4-3/8"h x 4"d Imprint Area: Back (Standard): 2"w x 3"h. Packaging: Gift boxed Pack Of: 1 Weight: 2 lbs. Challenge, strength, and endurance are just a few of the things symbolized by a mountain. When viewing a mountain we see the journey and the destination at a single glance. Designed to express these emotions, this award answers to those seemingly capable of moving mountains. 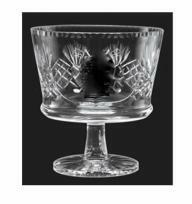 Cut from Starphire Crystal, the Pinnacle is held in place by its easel and chrome-plated sphere. 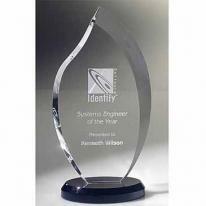 For aesthetics we recommend reverse-etching your award inscription and positioning your logo as shown. A romance card elaborating this theme is included for your presentation.Another J.Charles Theme-Award original. Further Description: Free copy change/personalization. Dimensions: 7" H x 4" W Max. Etch Area: Logo: 1.25" H x 3" W Copy: 2.25" H x 2.25" W Ship Weight: 1 lb. Leave it to flawless optic crystal to bring out the beauty of these ancient forms while enhancing their inherent mystique. Choose our basic style or the more elaborate Athena Obelisks with their impressive bases and towering height. Further Description: Free copy change/personalization. Dimensions: 6" H x 2.5" W Max. Etch Area: 2.25" H x 1.5" W Ship Weight: 2 lbs. 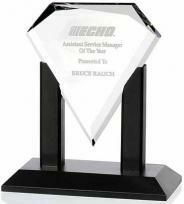 This diamond-shaped award provides a great focal point for your message. Great for the jewelry industry. Materials: Starfire glass on black satin wood base. Product Size: 6"w x 7"h x 3"d Imprint Area: Back (Standard): 2-1/4"w x 2"h Packaging: Gift boxed Pack Of: 1 Weight: 3 lbs. Cherry Finished Luster Wood/Crystal. Additional charges may also apply - please call. Approx. Overall Size W" x H" x D" : 2.75 x 5.25 x 2.25 (in.). Approx. Weight : 1.5 (lbs.). Approx. Image Area : 1 1/2 x 1 glass; 2 x 1 1/2 plate (in.). 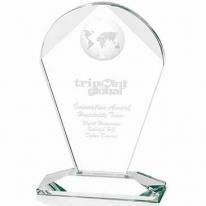 The eye-catching design of this Geodesic Award is the perfect place to display recognition or appreciation. Globe inset. Unique design. Materials: Optical crystal Product Size: 4-3/4"w x 6-3/4"h x 2-1/4"d Imprint Area: Back (Standard): 2"w x 2-1/4"h Packaging: Gift boxed Pack Of: 1 Weight: 2 lbs. 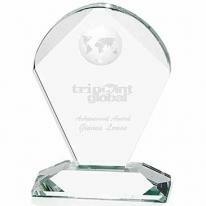 This multifaceted optically clear crystal award shimmers with many angles and facets. 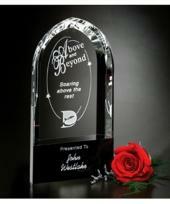 The black glass base enhances the award by providing extra dimension. Material: Black Glass/Optical Crystal. Dimensions: 4" W x 7" H x 1-1/2" D. Image Area: 1-3/4" W x 3" H. Black: 2-1/2" W x 1-1/4" H. Packaging: Black Gift. Weight: 3 lbs. Note: Shown with extra etch - add $6.25. Shown with colorfill - add $7.00. Presenting a Theme-Award not reserved in telling us of one possessing a certain verve. Nor is its spiral bashful about expressing a splendid ascent to the top. And its very festive look serves as a sure reminder that personal achievements are worthy of celebration. Available in starphire crystal or the less expensive jade. For aesthetics we recommend positioning your award inscription as shown. A romance card elaborating this theme is included for your presentation. Another J.Charles Theme-Award original. Further Description: Free copy change/personalization. Dimensions: 11.5" H x 3.75" W Max. Etch Area: Logo: 1.5" H x 2" W Copy: 1.5" H x 1.75" W Ship Weight: 3 lbs. 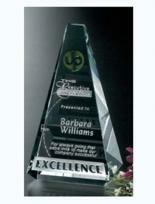 This 3/4" jade award sits horizontally on a jade base to prominently display any message. Wide logos and copy work well with this award. Materials: Jade glass Product Size: 8"w x 6-3/8"h x 4"d Imprint Area: Back (Standard): 7"w x 5"h. Packaging: Gift boxed Pack Of: 1 Weight: 6 lbs. 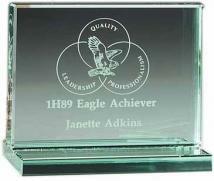 This 3/4" jade award sits horizontally on a jade base to display any message prominently. Good for the judicial and government sectors. Materials: Jade glass Product Size: 6-1/2"w x 8-3/8"h x 4"d Imprint Area: Back (Standard): 5"w x 7"h. Packaging: Gift boxed Pack Of: 1 Weight: 6 lbs. 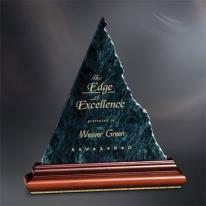 Recognize excellence within an organization with the exclusive crystal Vantage Peak Award. Material: Optical Crystal Dimensions: 4" W x 7" H x 2-3/4" D Image Area: 3" W x 3-1/2" H x 1-1/2" W Packaging: Black Gift Weight: 3.5 lbs. Notes: Shown with colorfill - add $7.00. Green Marble and Cherry Finished Wood with Brass Accents. Additional charges may also apply - please call. Approx. Overall Size: W" x H" x D" : 8 3/4 x 8 1/2 x 2 1/4 (in.). Approx. Weight : 2 (lbs.). Approx. Image Area : 4 x 6 (in.). 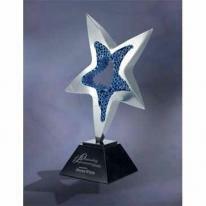 This striking Starfire award has beveled edges to create a dramatic look. Reward outstanding performance with this substantial award. Materials: Starfire glass Product Size: 6"w x 9-1/2"h x 3"d Imprint Area: Back (Standard): 3"w x 6-1/2"h. Packaging: Gift boxed Pack Of: 1 Weight: 4 lbs. Presenting a Theme-Award not reserved in telling us of one possessing a certain verve. Nor is its spiral bashful about expressing a splendid ascent to the top. And its very festive look serves as a sure reminder that personal achievements are worthy of celebration. Available in starphire crystal or the less expensive jade. For aesthetics we recommend positioning your award inscription as shown. A romance card elaborating this theme is included for your presentation. Another J.Charles Theme-Award original. Further Description: Free copy change/personalization. Dimensions: 13.5" H x 3.75" W Max. Etch Area: Logo: 2" H x 2.5" W Copy: 1.75" H x 2.25" W Ship Weight: 3.5 lbs. 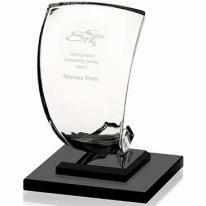 The sleek design of our jade award sits within a black marble base for a handsome look. Materials: Jade glass on black base Size : 8-1/2"w x 10-1/2"h x 2-1/2"d. Imprint Area: Front (Standard): 4-1/4"w x 4-1/4"h. Packaging: Gift boxed Pack Of: 1 Weight: 8 lbs. 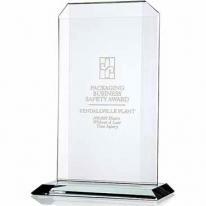 The design of this award will attract attention in every setting. Globe inset. Unique design. Materials: Optical crystal Product Size: 5-1/2"w x 8-1/2"h x 2-1/4"d Imprint Area: Back (Standard): 2-1/4"w x 3-1/2"h. Packaging: Gift boxed Pack Of: 1 Weight: 4 lbs. Cherry Finished LusterWood/Crystal. Additional charges may also apply - please call. Approx. Overall Size W" x H" x D" : 3.5 x 6.5 x 3.25 (in.). Approx. Weight : 2.25 (lbs.). Approx. Image Area : 1 1/2 x 1 1/2 glass; 2 3/4 x 2 plate (in.). The Marseikke Award is tribute to the skills of our designers. 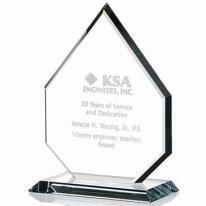 Multiple etching surfaces allow you greater flexibility in creating your award designs. 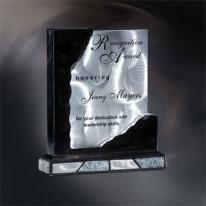 Material: Multiple Size: 10.75" x 3.75"
The mixture of metal and glass creates a wonderful contemporary award! Materials: Optical crystal and aluminum. 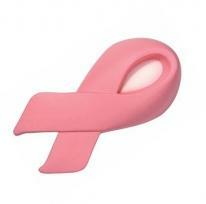 Size : 5-1/2"w x 11-1/2"h x 1-1/2"d. Imprint Area: Back (Standard): 4"w x 5"h. Packaging: Gift boxed Pack Of: 1 Weight: 3 lbs. The points of the Palisade Award are symbolic to an organization that has three branches, three locations, or three leaders. Each point of the triangle can represent a separate branch, location, or leader. 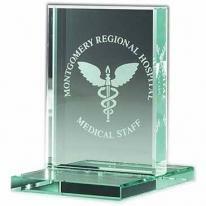 Material: Optical Crystal Dimensions: 7" W x 10" H x 2" D Image Area: 3" W x 7" H. Packaging: Black Gift Weight: 5 lbs. Notes: Shown with colorfill - add $7.00. 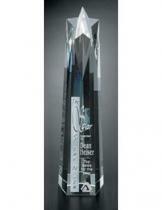 Combine the supreme achievements of recognition with a message etched on the radiantly beautiful Pacifico Award. 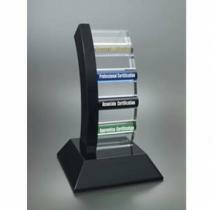 Material: Optical Crystal Dimensions: 4" W x 8" H x 1-3/4" D Image Area: 2-1/2" W x 4" H Packaging: Black Gift Weight: 4.5 lbs. 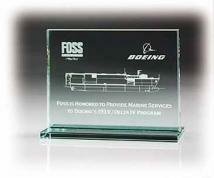 This award is great for when you have multiple sizes of awards to present! A great classic shape! Materials: Optical crystal Product Size: 5-1/2"w x 10-3/4"h x 3-1/2"d Imprint Area: Back (Standard): 3-1/4"w x 5"h. Packaging: Gift boxed Pack Of: 1 Weight: 4 lbs. This large size and unique design make a stunningly clear presentation. Globe inset. Unique design. Materials: Optical crystal Product Size: 6-1/2"w x 10-1/2"h x 2-1/4"d Imprint Area: Back (Standard): 2-1/2"w x 4-1/2"h. Packaging: Gift boxed Pack Of: 1 Weight: 5 lbs. Presenting a Theme-Award not reserved in telling us of one possessing a certain verve. Nor is its spiral bashful about expressing a splendid ascent to the top. And its very festive look serves as a sure reminder that personal achievements are wor thy of celebration. Available in starphire crystal or the less expensive jade. For aesthetics we recommend positioning your award inscription as shown. A romance card elaborating this theme is included for your presentation. Another J.Charles Theme-Award original. Further Description: Free copy change/personalization. Dimensions: 11.5" H x 3.75" W Max. Etch Area: Logo: 1.5" H x 2" W Copy: 1.5" H x 1.75" W Ship Weight: 3 lbs. 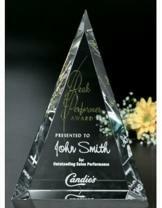 Vertical design and a lighted base add impact and display value to the Vertical Highlight Award. 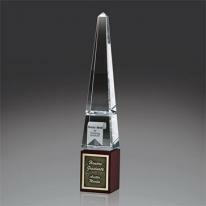 Any logo will sparkle on this towering award! Materials: Optical crystal on lighted wood base. Product Size: Award: 2-5/8"w x 7-7/8"h x 1-3/16"d|Base: 5"w x 1-3/4"h x 4"d. Imprint Area: Back (Standard): 1-1/4"w x 4"h. Packaging: Gift boxed Pack Of: 1 Weight: 4 lbs. 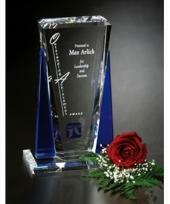 A stunning 24% lead crystal spinnaker sits atop a square base and is a wonderfully unique award! Signed by Italian designer Mario Cioni. Materials: 24% lead crystal on black glass base. Product Size: 5"w x 7-3/4"h x 6"d. Imprint Area: Front (Standard): 1-1/2"w x 2"h Packaging: Gift boxed Pack Of: 1 Weight: 5 lbs. 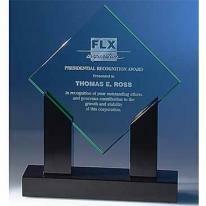 This award is great for when you have multiple sizes of awards to present! A great classic shape! Materials: Optical crystal Product Size: 7-3/4"w x 12-3/4"h x 4"d Imprint Area: Back (Standard): 4"w x 6"h. Packaging: Gift boxed Pack Of: 1 Weight: 6 lbs. 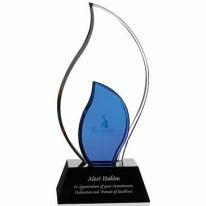 This award is for that special employee that who really stands out in your company. Good for the hospitality industry Shown with optional second etch area on flame. Materials: Optical crystal on black glass base Product Size: 5-1/8"w x 10-5/8"h x 2-3/4"d Imprint Area: Base (Standard): 3-1/4"w x 1-1/4"h|Front Flame (Optional): 1-3/4"w x 2"h. Packaging: Gift boxed Pack Of: 1 Weight: 4 lbs. Display your appreciation in dramatic fashion. Optional lighted wood base available; contact customer service. Materials: Optical crystal. 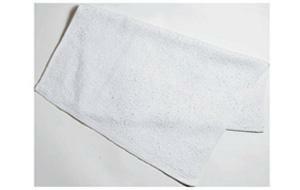 Size : 2-1/2"w x 12"h x 2-1/2"d. Imprint Area: Back (Standard): 2"w x 3"h. Packaging: Gift boxed Pack Of: 1 Weight: 7 lbs. Presenting a Theme-Award not reserved in telling us of one possessing a certain verve. Nor is its spiral bashful about expressing a splendid ascent to the top. And its very festive look serves as a sure reminder that personal achievements are wor thy of celebration. Available in starphire crystal or the less expensive jade. For aesthetics we recommend positioning your award inscription as shown. A romance card elaborating this theme is included for your presentation. Another J.Charles Theme-Award original. Further Description: Free copy change/personalization. Dimensions: 13.5" H x 3.75" W Max. Etch Area: Logo: 2" H x 2.5" W Copy: 1.75" H x 2.25" W Ship Weight: 3.5 lbs. Ebony Stone and Random-Sanded Aluminum Insert -Small One screened imprint position with one color included. Available in 3 sizes. Additional charges may also apply - please call. Approx. Overall Size W" x H" x D" : 8 x 9-1/4 x 2-1/4 (in.). Approx. Weight : 2-1/2 lbs. Approx. Image Area : 4-1/2 x 5 (in.). Ebony Stone and Random-Sanded Aluminum Insert -Medium One screened imprint position with one color included. Available in 3 sizes. Additional charges may also apply - please call. Approx. Overall Size W" x H" x D" : 9-1/4 x 10-1/4 x 2-1/2 (in.). Approx. Weight : 3-1/4 lbs. Approx. Image Area :5 x 5-1/2 (in.). Cherry Finished LusterWood & Crystal. Additional charges may also apply - please call. Approx. Overall Size W" x H" x D" : 2.75 x 7.5 x 2.75 (in.). Approx. Weight : 3 (lbs.). Approx. Image Area : (A) 2 x 1.625 glass; (B) 2.375 x 1.875 plate (in.). 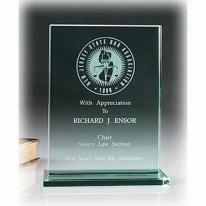 Ebony Stone and Random-Sanded Aluminum Insert - Large One screened imprint position with one color included. Available in 3 sizes. Additional charges may also apply - please call. Approx. Overall Size W" x H" x D" : 10-3/4 x 12 x 3-1/4 (in.). Approx. Weight : 4 (lbs.). Approx. Image Area : 5-1/2 x 6 (in.). 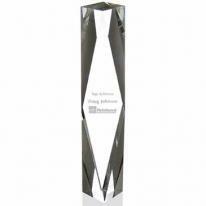 The intricate bevels in this optically clear inverted pyramid, precisely coupled with two blue optical crystal pyramids, give a diamondesque appearance to the Sentinel Award. 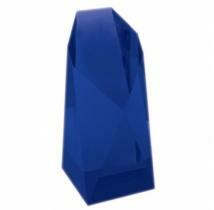 Material: Blue/Optical Crystal. 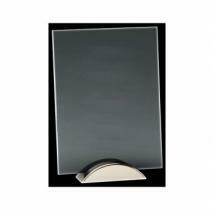 Dimensions: 6" W x 8-1/2" H x 4" D. Image Area: 2-1/2" W x 5-1/2" H. Packaging: Black Gift. Weight: 7.5 lbs. Notes: Shown with colorfill - add $7.00. Exclusively from Norwood, the Ebonite Duet Echo Award combines dimensional features with stately black accent. Materials: Black and Starfire Glass. Size : 7"w X 12-1/2"h X 3"d. Imprint Area: Back (Standard): 2-1/2"w 9-1/2"h Packaging: Gift boxed Pack Of: 1 Weight: 5 lbs. Unique shape gives the Starfire Arrowhead Award its name. Materials: Starfire glass Product Size: 6-1/4"w x 8-3/4"h x 3"d Imprint Area: Back (Standard): 3-1/2"w x 3-1/2"h. Packaging: Gift boxed Pack Of: 1 Weight: 4 lbs. Cherry Finished LusterWood & Crystal. Additional charges may also apply - please call. Approx. Overall Size W" x H" x D" : 2.75 x 13 x 2.75 (in.). Approx. Weight : 4.75 (lbs.). Approx. Image Area : (A) 2.25 x 2.25 glass; (B) 2.25 x 2.75 plate (in.). 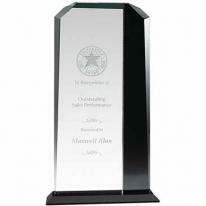 The Polaris Star Tower is a perfect way to honor the star performance and success in a company. Material: Optical Crystal Dimensions: 3-1/2" W x 14" H x 3-1/2" D Image Area: Bottom: 1-1/2" W x 7" H Top: 1" W x 1" H Packaging: Black Gift Weight: 8 lbs. Polished Silver Stainless, Metallic Blue M6 Accents and Black Marble Base. Additional charges may also apply - please call. Approx. Overall Size: W" x H" x D": 7 x 11-1/4 x 4 Approx. Image Area: 2 x 1-3/4 Approx. Weight: 3 lbs.